I was recently requested to do a post on ‘What to wear for the gym/workout/exercise,I see so many random combinations or inappropriate outfits when I go to the gym!’ and I completely agreed. I recently started going to the gym, about 2 months now and there are a lot of outfits that weren’t great. Many ladies wear either far too little or feel that baggy clothes hide them and make them look better. I was initially in the second category wearing baggy t-shirts to hide beneath but swapped to something more fitting and designed for the gym and realised how much cooler and easier it was to work out that way. I also looked far slimmer than wearing something so oversized. 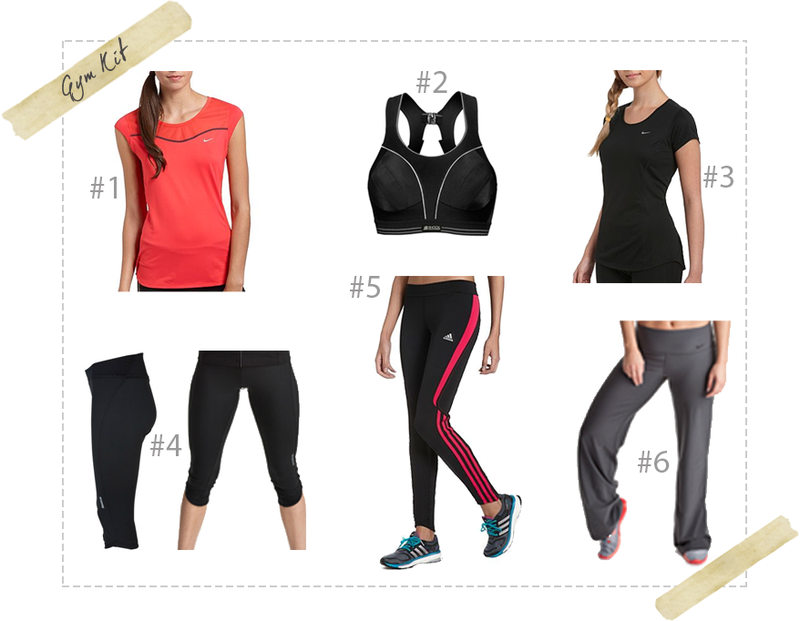 So below are some different gym clothes outfit options that I think are perfect for the gym! This women’s Nike top is a mesh style top meaning that it provides ventilation throughout your body. It has an advanced dri-fit fabric to keep you cool as you move, helping you to work out to your full potential. This running bra is designed specifically for running to provide total support and friction-free comfort. It offers non slip straps and moisture-wicking fabrics. It claims to reduce breast movement by up to 78% and also has a range of sizes up to an F which is great for larger cup sizes who need this support! The black colour is flattering and gives you coverage as you move. This top is made from advanced dri-fit technology and the stretchy fabric keeps you cool and dry during your workout. These 3/4 tights feature Reebok soft, lightweight sweating fabric which wicks sweat away from the top layer of the skin to the outside of the pants so it can evaporate. The tights are fitted, and are great for running, cycling and any sports where you need freedom to perform. In black, these flattering pants hug your body, giving you support and definition. Ultra comfortable during exercise, these long length leggings are made from climacool fabric, meaning your skin can breath. Motion-ready design built to flatter These trousers blend comfort and style, they are a flattening, sweat-wicking essential. These trousers are less tight and have a wider waistband for a flat, smooth look on your stomach without looking baggy or getting in the way of a work out!